Enjoy all the benefits of advanced LED energy-saving technology with the Feit Electric BPEXN/500/850/LEDG2 50W MR16 LED Light Bulb. This 5000K daylight bulb is dimmable and will replace a 50-watt equivalent incandescent bulb. It produces a similar light output (500 lumens), uses 7 watts of electricity and up to 86 percent less energy than a standard incandescent light bulb. Get instant on to full brightness with relatively cool running performance. Feit Electric MR16 bulbs have an average life of 25,000 hours / 22.8 years are RoHS compliant and 100 percent mercury free. Choose a dependable 12V MR16 track and landscape lighting bulb for residential or commercial applications. This set of two Gama Sonic GS-150 solar accent spotlights, each with four colour filters, is designed for illuminating trees, shrubs, signs, flags, or any part of your home. This set includes two lights, each with red, yellow, blue, and green colour filters. Installation is as simple as staking the spotlights and their solar panels in a sunny spot in a garden or on a pathway, and that's it. No electrical wiring is needed. The panels can be up to 10 feet from the lights. When sunlight hits the panels, it charges the spotlights' internal 1,100 mAh Lithium Ion battery packs. Each spotlight has a bright white LED that will come on automatically at dusk and stay lit at a brightness of 80 lumens for up to eight hours on a full solar charge. Insert one of the included blue, yellow, red, or green colour filters for tinted light that brings extra ambience, variety, and fun. Each GS-150 light fixture is made from weather-resistant, powder-coated cast-aluminum, and the frame of the external solar panel is made of plastic. Add style and enhance the beauty of your home and garden with this landscape cast aluminum spot light of the highest professional quality. Black UV protected paint finish and the heat resistant glass lens are great for durable outdoor use. This spot light has an adjustable tilt lantern head that will help you direct the light exactly where you want to. This box includes 1 black cast aluminum spot light, 1x 20W halogen MR16 bulb, 12 inch SPT-1 18 gauge with connector box. The Mr Beams Mini LED Spotlight provides bright light in a small package that can fit almost anywhere. With its compact and weatherproof design and white colour, the motion-sensing, battery-powered Mini LED Spotlight fits perfectly in those hard-to-see tight corners in closets, sheds, pantries and doorways and provides discrete outdoor lighting that can withstand all weather conditions. 5W (50W) Warm White (3000K) MR16 GU5.3 LED Flood Light Bulb Dimmable 12 Volts 500 Lumens Enjoy all the benefits of advanced LED energy-saving technology with the Feit Electric BPEXN/500/850/LEDG2 50W MR16 LED Light Bulb. This 5000K daylight bulb is dimmable and will replace a 50-watt equivalent incandescent bulb. It produces a similar light output (500 lumens), uses 7 watts of electricity and up to 86 percent less energy than a standard incandescent light bulb. Get instant on to full brightness with relatively cool running performance. 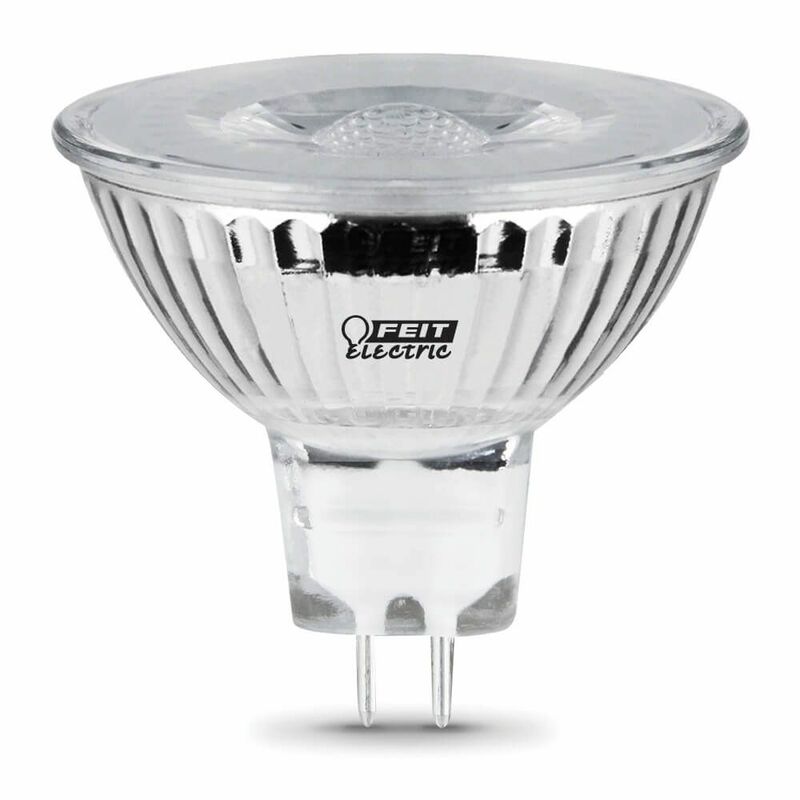 Feit Electric MR16 bulbs have an average life of 25,000 hours / 22.8 years are RoHS compliant and 100 percent mercury free. Choose a dependable 12V MR16 track and landscape lighting bulb for residential or commercial applications.